Over the past few weeks I’ve been doing background reading on Joan of Arc. In doing so I unearthed the following interesting story…. One of the leading military figures who fought with Joan during the Loire Campaign of 1429 was the knight, Étienne de Vignolles (b.1390, d.1443), also called La Hire (“The Ire” in Old French). 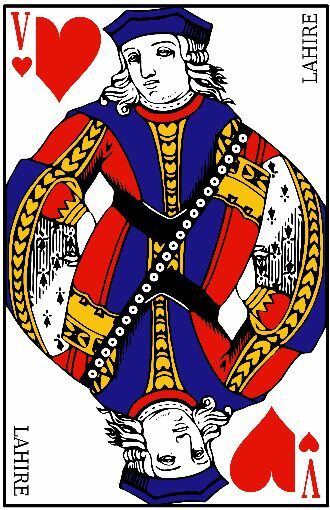 On many packs of French playing cards La Hire is represented as the Jack of Hearts (see left #). La Hire was one of two knights who fought alongside Joan of Arc (the other being Ponton de Xaintrailles). Both these knights were ruthless, professional and ambitious soldiers who are known to have behaved at times with great cruelty and barbarity. They were typical of opportunist knights known as “écorcheurs” (“flayers of dead bodies”) who were armed bands who desolated France in the early 15th century stripping their victims of everything, often to their very clothes. This is far from the images usually portrayed of virtuous knights fighting alongside and being inspired by Joan of Arc. It was La Hire who commanded the advance guard at one of the most deciding battles of the 100 Years War, the Battle of Patay, just to the North of Orleans. Thus La Hire’s place in history was assured ~ yet surly, his military reputation is trumped by the legend of France’s Patron Saint, the young Joan Of Arc, herself. All of which takes us back rather neatly to French playing cards. *’Hector’ may be after the mythological hero of the Iliad, but may have been named after La Hire’s brother. The Heros, or “Worthies”, as listed above, played a very important role in the psyche and moral framework of Europeans during the Middle Ages (but, more on this another day!). 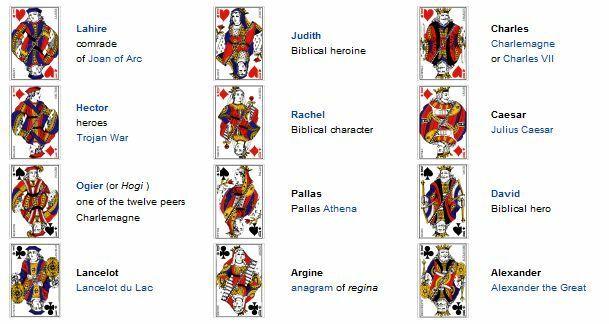 This entry was posted in Joan of Arc, Medieval history and tagged Étienne de Vignolles, écorcheurs, Battle of Patay, French playing cards, Jeanne d'Arc, Joan of Arc, La Hire, Lahire, Loire, Loire Valley, Loire Valley History, Piquet, playing cards, Ponton de Xaintrailles, Touraine, Touraine History. Bookmark the permalink. Very interesting article Jim, really enjoyed it. I am inspired to take photos of the whole deck now…starting with the Kings, Queens and Jacks, drop in and have a look. The Joan of Arc card is amongst them. I am intrigued by the names on these cards…I hope this leads to even more information. I’d love to see the cards once you’ve photographed them. Do keep in touch.